Aerial Lift Certification Calgary - Aerial Lift Certification is for personnel who require a thorough knowledge of aerial lift safety. Maintenance workers, construction craftsmen and supervisors require this training to ensure that inspectors and operators are qualified. Provincial, state and federal rules require companies to be certified in order to do in-house aerial lift checks. Regardless of differences in the type of work being done, all workers who perform tasks at elevated levels usually utilize the same means to access the required height. Aerial lifts and scissor lifts are the mechanized machines made use of to be able to lift equipment and employees to elevated sites. Bucket trucks called Cherry Pickers are aerial platforms that feature a supported boom and bucket. The primary danger to using this kind of platform is usually electrocutions, tip-overs and falls. Certification guarantees that workers who use aerial lifts are properly trained to safely work the machine. Training likewise ensures that workers know how to maintain aerial work platforms in accordance with the manufacturer's directions. 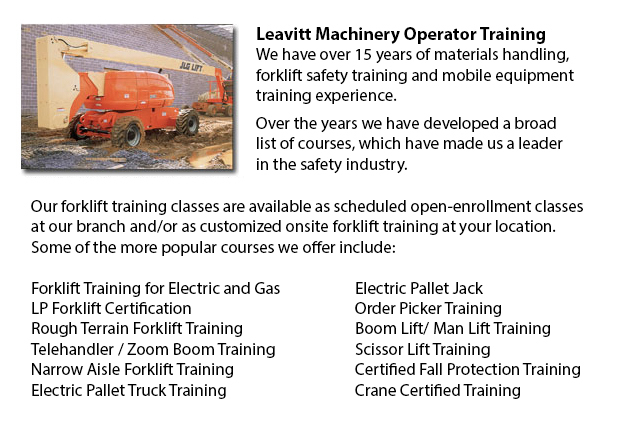 Training covers the following lifts: Aerial lifts that are mounted to vehicles, Boom-supported aerial lifts and scissors lifts. Trainees would gain an understanding of the causes and results of aerial lift incidents, and will learn safe operating procedures. They will be technically competent in the various kinds of aerial lifts, as well as parts and terms. From interpreting rated capacity charts to selecting the best aerial lift for the task, the certification program would provide employees with everything they need to know in order to perform their work safely. Inspectors and supervisors who have the task to check aerial lift machines must know how to inspect gears, booms, operating mechanisms, structural parts, control systems and functions, power plants, braking systems, attachments, pins and shafts, hydraulic, pneumatic and electric parts, operator aids and emergency safety devices, and so forth. Training will consist of the following: the role of the inspector in reducing liability exposure and accidents; how to perform a pre-use, monthly and annual check; how to write inspection reports; how to apply and interpret rules regarding aerial lift safety standards; checklists and techniques; inspection procedures; following record keeping requirements; understanding and applying the three levels of aerial lift inspection; and when to remove defective aerial lifts from service.